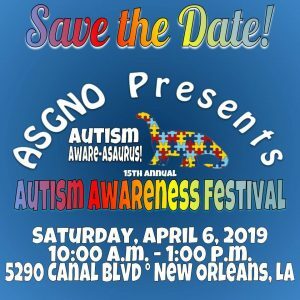 The Autism Society of Greater New Orleans, an affiliate of the National Autism Society, is hosting our 15th Annual Autism Awareness Festival (previously a Walk) which will be held on Saturday, April 6, 2019 at First Baptist New Orleans, 5290 Canal Blvd., New Orleans, LA 70124. We are seeking vendors and agencies to participate in our event. Indoor spaces are in limited supply and will be filled, by request only, on a first come – first served basis. Please indicate on the application that you would prefer an inside space and we will do our best to accommodate. Non-profit organizations are welcome to present at the festival free of charge. Please provide proof of your non-profit status. For profit organizations will be charged $25 for a space. If you are selling items at the Festival, we ask that 25% of your sales be donated back to the ASGNO. Please be aware the 15th Annual Autism Fest is a RAIN OR SHINE event, no refunds will be issued for vendor cancellations. Deadline for Vendor Applications is March 18, 2019. Please fill out the online application linked below after reviewing the information provided in the first section of the form. You will be notified of your application acceptance or denial within three business days of your submission. If you are a for-profit company and your application is approved, you can submit your payment either via mail with a check payable to the “Autism Society – Greater New Orleans,” P.O. Box 7028, Metairie, LA 70010 or by paying online with the link provided in your acceptance email. Please note: Online Payments will be subject to a 2.2% convenience fee.